When a stainless steel liner is installed it should be secure at both the top and the bottom. Very often other companies that install liners use what are called flat top plates on a terracotta tile and then add caulk to create a seal. The problem with this is that there are no screws holding everything in place and very often we have to repair this area. When wind, rain, and the heat of the flue combine together the caulk often loosens and creates a gap in the system where there should not be one. The fix is fairly straight forward with us removing the old top connection and cap if need be with a proper top plate that is either drilled and anchored or screwed on. To schedule a top plate and cap installation or other repair please visit our contact page and we will respond as soon as possible to set up a date with you. We also offer a fully documented visit stating the health of your system via a $99 Level 1 Inspection to determine the health of your system. Let's address these reasons in a little more depth--first, by preventing water from entering the chimney you are extending the life of the flue and masonry both visible and hidden. Although wood is not as corrosive as oil, coal, nor high-efficiency gas furnaces, it's exhaust mixture has been chemically analyzed to contain 67 different combustible gases. Many of these are corrosive when they are not burned and condense out within the flue system. Oil is very corrosive along with producing additional condensation. We have found that on average after a period of 40-60 years the surface of a tile lined oil flue becomes very unsafe due to moisture mixing with oil exhaust gases causing severe deterioration of the tile. 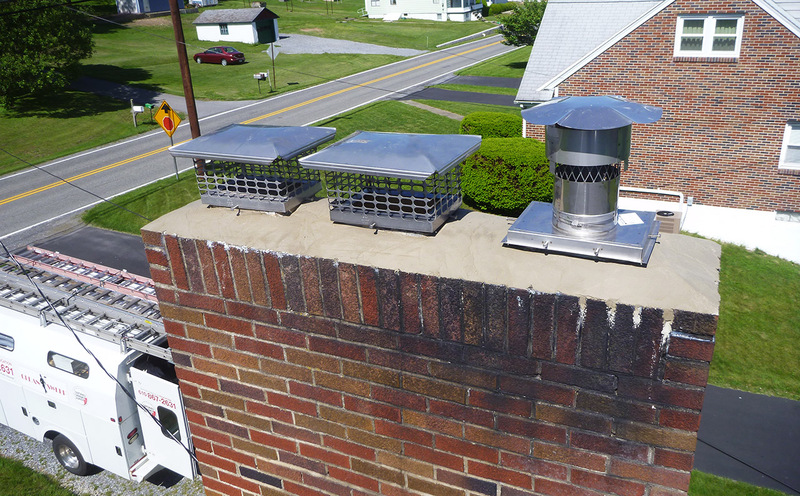 Keeping animals out is of course a no-brainer but here is another scenario to consider: When you do not have a chimney cap (or have a poorly designed cap) and are heating your home in the winter your oil/gas furnace or stove is producing carbon monoxide and heat. Birds are often drawn to the warmth of the chimney and will perch on top of it but the poisonous gas will knock them out which leads to them falling down the flue creating a blockage. That same carbon monoxide will start making its way back into your home creating a very serious and potentially deadly situation for you and your family.